This is a PVD-coated Titanium Jaeger LeCoultre Master Compressor Diving GMT Navy Seals, Q178T471178. It has an alligator leather strap with a stainless steel tang buckle, and a scratch resistant anti-reflective sapphire crystal. It has a solid screw-down case back engraved with the Navy Seals logo and secured with 4 screws. There is also a rubber-clad screw-down compressor key winding crown (water-resistant to 100 meters by way of four sealing gaskets) and rubber-clad chronograph pushbuttons with patented locking mechanisms. The 46.3mm diameter solid three-body case, downturned lugs, and unidirectional rotating ceramic bezel With 60 minute diving Scale are polished/brushed. There is a date aperture window between 4 and 5 o'clock, a constant seconds subsidiary dial at 6 o'clock, a 12-hour dial at 9 o'clock, and a 30-minute register at 3 o'clock. 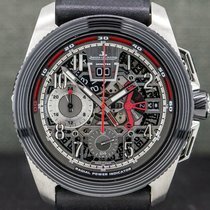 There is an outer 60-minute/1/5 second chronograph track with yellow Arabic numerals every five minutes, and a day/night indicator at 12 o'clock. The dial is black with luminescent dart hour indexes, and an Arabic 12 at the 12 o'clock position. There are luminous thick baton hands and a center white GMT chronograph hand with a yellow tip. 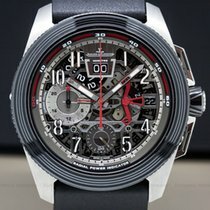 It's water resistant to 300 meters/1000 feet, and it has a 65-hour power reserve at full wind. The 18mm thick case, dial, and movement are all signed. 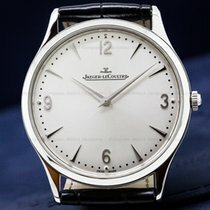 The mechanical automatic self-winding Jaeger LeCoultre caliber 757 movement is rhodium-plated, with fausses cotes embellishment. It has two barrels, a shock absorber mechanism, and it's constructed with 45 jewels, 300 components, and a straight-line lever escapement. It includes a monometallic balance that's adjusted for temperature and 6 positions, a self-compensating fat balance spring, and the oscillating rotor is ornamented with Cotes Circulaires and with the gold inscriptions, "Jaeger LeCoultre - 1000 Hours Control". The mechanism oscillates at a frequency of 28,800 vph (4 Hz). 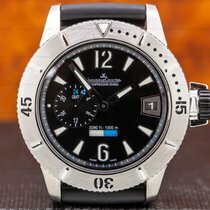 This Jaeger LeCoultre Master Compressor Diving GMT Navy Seals, Q178T471178 was produced in a limited edition of 500 examples. The black ceramic bezel is two and a half times stronger than steel.